There is no way to tell the exact number, but we estimate approximately 15,000 Messianic Jewish believers live in Israel today. They come from various backgrounds and walks of life. The majority are still immigrants—many from the former Soviet Union and North and South America, with a growing number of sabra (native born in Israel) Jews—individuals and entire families, young and old, Sephardic and Ashkenazi. Because of our faith in the Bible and the words of Yeshua, the Messianic Jews in Israel are outstanding citizens. Israeli Messianic Jews pay taxes, serve in the IDF (Israel Defense Forces), are honest business owners and valuable employees. We embrace the Feasts of the Lord and other Biblical appointed times and celebrate them together. During these Jewish celebrations we are able to invite our non-believing family and searching friends. We love to fellowship together, pray together and share our lives with one another as we follow the Lord with the same passion of our ancestors in the Bible. 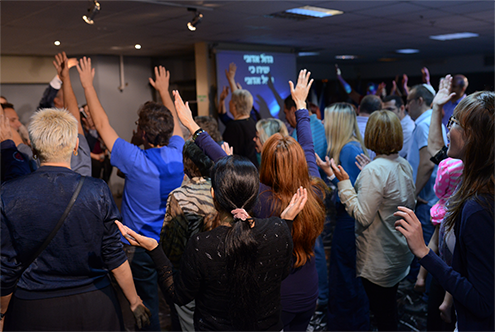 One of the greatest rewards for us (Ari and Shira), as pioneers of the Messianic movement in Israel, is to see the body of Messiah from all corners of Israel come together to worship the Lord and celebrate our faith. This is why Maoz sponsors and partners in many conferences open to believers (and sometimes non-believers) from all over Israel—including summer youth conferences, conferences with international speakers, leadership conferences and more. And despite the ongoing persecution of Messianic believers in Israel, the body of Messiah is growing as more and more Israelis are accepting Yeshua as their Messiah and Savior. We all look for the day to see the promise of God fulfilled in His Holy Land—that all Israel shall be saved.